Renew your faith. Recharge your life. During the month of October, I'll be writing 31 devotions based on Proverbs 31:10-31 - the basis for A Wife Like That. I hope you'll take time each day to come be encouraged and challenged. Is this "wonder woman" someone we could ever hope to model in today's real-life? Why does God speak so highly of her? 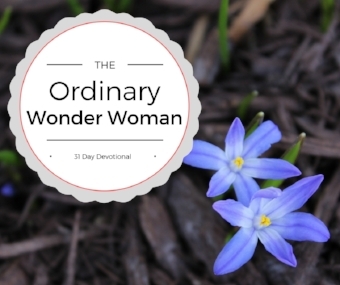 How can God use my ordinary to make me into a wonder woman in my own home and life? Come along with me and dig into this amazing woman's ordinary every day! I want to ignore the dishes, laundry, piles of mail, and dirty floors. I don’t want to take the time to plan meals, find coupons or go grocery shopping. Netflix is so much more appealing than reading about how to get stains out of the couch.